Predict the direction of water transport across the membrane under different conditions of salt and osmolarity. Distinguish among the types of transport (simple diffusion, facilitated diffusion, and active transport), based on their kinetics and energy requirements. The cell membrane is a fundamental and defining feature of cells. It is composed of a phospholipid bilayer, with the hydrophilic phosphate “head” groups facing the aqueous environment on either side, and the hydrophobic “tails” in middle. The two “leaflets,” the inner leaflet on the cytoplasmic side of the membrane and the outer leaflet on the extracellular side, have different lipid compositions. Cell membranes also contain an approximately equal part, by mass, of integral membrane proteins; meaning proteins that are firmly embedded in the hydrophobic lipid bilayer. Some integral membrane proteins have alpha-helical domains that traverse the membrane (transmembrane domains). Other proteins, called peripheral membrane proteins, are loosely and reversibly associated with membranes, interacting with the polar phosphate head groups. Cell membranes also have carbohydrates, in the form of oligosaccharides, covalently attached to membrane proteins (glycoproteins) or to lipids (glycolipids). The lipids and integral membrane proteins diffuse laterally within the plane of the membrane; hence the “fluid mosaic model” of cell membranes. However, because of the hydrophobic inner core, phospholipids and integral membrane proteins do not spontaneously cross the lipid bilayer or flip across it from one side to the other. The 3 domains of life: Bacteria, Archaea and Eukarya, have distinct membrane lipids that pose challenges and offer hints to reconstructing the evolutionary history of life on Earth. All cells have phospholipids (glycerol-phosphate with two hydrocarbon chains) in their membranes. Bacteria and Eukarya both have membrane phospholipids with fatty acid chains ester-linked to D-glycerol. Archaea, however, have utterly different membrane phospholipids, with branched isoprene chains instead of fatty acids, L-glycerol instead of D-glycerol, and ether linkages instead of ester linkages (see http://www.ucmp.berkeley.edu/archaea/archaeamm.html and http://en.wikipedia.org/wiki/Archaea). The ether linkages and isoprene chains make Archaeal membranes more resistant to heat and pH extremes. Current hypotheses suggest that eukaryotic cells arose from a fusion between an archaeal cell and a bacterial cell. Based on DNA sequence similarities, eukaryotic information processing genes are descended from archaea (Allers and Mevarech 2005, Cotton and McInerney 2010), whereas eukaryotic membrane phospholipids synthesis genes and energy metabolism genes appear to have descended from bacteria. Eukaryotes also have membrane lipid innovations that are not found in either Archaea or Bacteria: sterols and sphingolipids. Sterols (like cholesterol) and sphingolipids (phospholipids with fatty acid chains linked to the amino acid serine instead of to glycerol) are major components of eukaryotic plasma membranes, and together can constitute 50% of the lipids of the outer leaflet (Desmond and Gribaldo, 2009; sphingolipids are not found in the cytoplasmic side of the plasma membrane lipid bilayer). Sterols are essential in all eukaryotic cell membranes. Sterols reduce membrane fluidity and permeability, and increase membrane rigidity and strength. Together with sphingolipids they help organize regions of the membrane into lipid rafts, microdomains in the plasma membrane with increased rigidity, that organize cell signaling proteins into functional complexes (see review by Lingwood and Simons, 2010). Sterol biosynthesis is a complex pathway that requires molecular oxygen (O2); 11 molecules of oxygen are required to synthesize just one molecule of cholesterol (Desmond and Gribaldo, 2009). Therefore, steroid biosynthesis could not have evolved before the Great Oxygenation Event, circa 2.4-2.5 billion years ago, when free oxygen first began to accumulate in Earth’s oceans and atmosphere. Significantly, this time coincides with the origin of eukaryotes in the fossil record. Evolution of steroid biosynthesis pathways thus looks like one of the keys to evolution of eukaryotes. Not to be left out, bacteria have their own special membrane adaptations in the form of hopanoids, the bacterial equivalent of membrane sterols. Hopanoids have 5 rings, and do not require oxygen for their biosynthesis. The fluidity of a lipid bilayer varies with temperature. At higher temperatures, lipid bilayers become more fluid (think about butter melting on a hot day), and more permeable or leaky. At lower temperatures, lipid bilayers become rigid (like butter in the refrigerator). For cell membranes to function properly, they must maintain a balance between fluidity, to allow movement of proteins and lipids within the membrane, along with membrane curvature, bending, budding and fusion, without compromising membrane integrity and allowing substances to leak into or out of the cell. Sterols such as cholesterol in mammals, ergosterol in fungi, and phytosterols in plants, buffer membrane fluidity and permeability over a broad temperature range. In mammals, cholesterol increases membrane packing to reduce membrane fluidity and permeability. The fatty acids tails of phospholipids also affect membrane fluidity. Fatty acids can vary in length, and the number of double bonds in the hydrocarbon chain. Fatty acids with no double bonds in the hydrocarbon chain are called “saturated” because they have the maximum number of hydrogens. “Unsaturated” fatty acids, with one or more double bonds, have fewer hydrogens (2 fewer per double bond). Naturally-occurring unsaturated fatty acids are cis-unsaturated, meaning the remaining hydrogens are on the same side of the molecule, and results in a bend in the hydrocarbon chain. 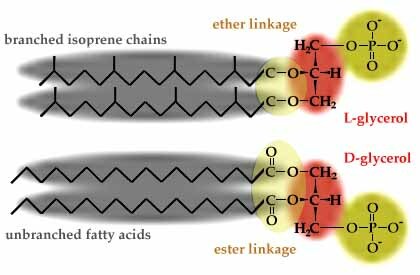 Trans-unsaturated fatty acids, with the hydrogens on opposite sides, still result in a nearly straight hydrocarbon chain. Trans-unsaturated fatty acids are rare in nature, but are produced when vegetable oils are partially hydrogenated in food processing. Elaidic acid is the principal trans unsaturated fatty acid often found in partially hydrogenated vegetable oils. Oleic acid is a cis unsaturated fatty acid making up 55–80% of olive oil. Stearic acid is a saturated fatty acid found in animal fats. Stearic acid is neither cis nor trans because it has no carbon-carbon double bonds. cis-unsaturated fatty acids increase membrane fluidity and permeability by disrupting close packing of fatty acid tails. Cis-polyunsaturated (2 or more double bonds) fatty acids are even more bent and disruptive. organisms adapt to cold temperatures by increasing the amounts of cis-unsaturated fatty acids to keep their membranes fluid. One way to remember how different lipids affect membrane fluidity or rigidity is that lipids that can pack more tightly (like saturated fatty acids and sterols) make membranes more rigid and stronger, but less fluid. Anything that disrupts close packing of lipids, such as higher temperatures or unsaturated fatty acids with kinks or bends, make membranes more fluid. The lipid bilayer is “semi-permeable,” meaning that some molecules can diffuse rapidly across the membrane, while other molecules cross only very slowly or not at all. In general, small uncharged molecules like O2 and CO2 can diffuse across freely, while charged molecules (Na+, H+) or polar molecules (glucose) cannot. Even water molecules diffuse only slowly across cell membranes, because water molecules are highly polar. Osmosis is the diffusion of solvent (water) molecules across a membrane. Diffusion results in net movement of molecules down their concentration gradient, from an area of high concentration to an area of low concentration. In the case of osmosis, water molecules move from the side with low solute concentration to the side with higher solute concentration. If there is a difference in solute concentrations across the membrane, then solute molecules will try to diffuse across the membrane to equalize solute concentrations. But if the membrane is impermeable to the solute molecules, then water will move to try to equalize the solute concentrations. Cells are adapted to their aqueous environment in terms of their cytoplasmic solute concentrations. Mammalian cells have cytoplasmic solute concentrations that balance the physiological salt concentrations. In physiological saline solutions, mammalian cells are in an isotonic environment, meaning the solute concentrations inside the cell and outside the cell are in balance, so there is no net movement of water across the cell membrane. In a hypotonic solution, the solute concentration outside the cell is lower than inside the cell, so water will enter the cell to try to reduce the internal solute concentration. In a hypertonic solution, the solute concentration outside is higher than inside the cell, so water will exit the cell and the cell will shrivel up. How do cells transport molecules like glucose across the membrane? Membranes have dedicated transport proteins with transmembrane domains. Several transmembrane domains cluster to form channels in the membrane that are specific for various molecules like glucose, phosphate, Na+, H+, Cl-, and even H2O. Water transport is mediated by highly conserved proteins called aquaporins, which are present in all 3 domains of life. The movement of molecules through protein channels is called facilitated diffusion. The protein channels are highly specific for the molecule, and again results in net transport down a concentration gradient, from a region of high concentration to a region of low concentration. What if the cell wants to move molecules against a concentration gradient? Even when phosphate concentrations outside the cell are very low, cells can transport phosphate into the cell, where the cytoplasmic concentration of phosphate may be much higher. Active transport of molecules against their concentration gradient requires expenditure of energy, often in the form of hydrolysis of ATP. Active transport is easy to identify because it requires energy, and transports against the concentration gradient. But is it possible to distinguish facilitated diffusion from simple diffusion? Because facilitated diffusion is mediated by protein channels, and because the number of protein channels in a cell membrane is limited, facilitated diffusion shows saturation kinetics. As the concentration difference across the membrane becomes greater, the rate of molecules diffusing across the membrane increases, for both facilitated and simple diffusion. However, facilitated diffusion through protein channels will reach a limit, when molecules are passing through all available protein channels as fast as they can. Further increases in the concentration of molecules cannot cause faster diffusion, because every channel is busy and molecules have to wait for openings. Active transport will also display saturation kinetics, for the same reason. Simple diffusion will rarely reach such a limit, because the entire area of the membrane is available. 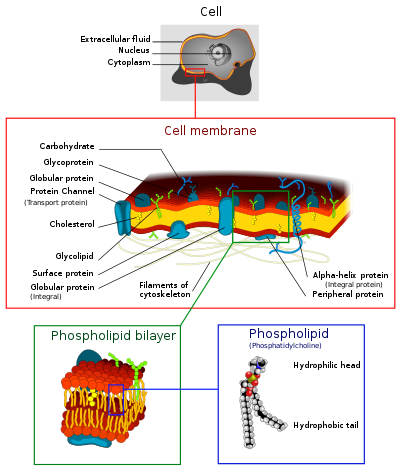 To summarize membranes and transport, check out this animation: http://www.johnkyrk.com/cellmembrane.html – one mistake is that the animation incorrectly shows sphingolipids on both sides (leaflets) of the plasma membrane, whereas sphingolipids are located only on the outer (extracellular side) leaflet. To test your understanding of transport processes, look at this teaching tidbit on Cell Membrane Permeability. Written by: Jung Choi on September 23, 2012.on April 18, 2018. Choi is the man!!! Reading this an watching the videos didn’t even feel like a chore. Sep 6, 2016 – Added a paragraph on osmosis and explanation of isotonic, hypotonic, and hypertonic solutions.